Review of the video of the Samba performance. 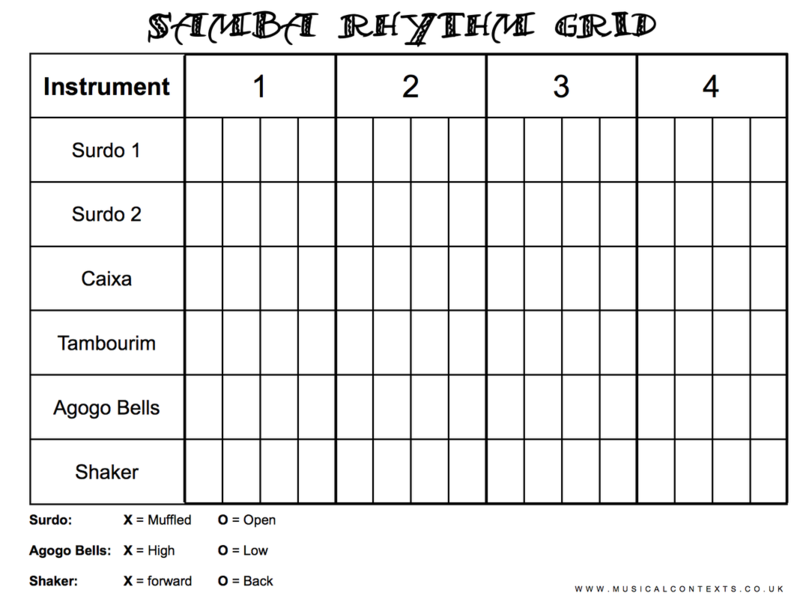 In groups compose and perform your own Samba composition. 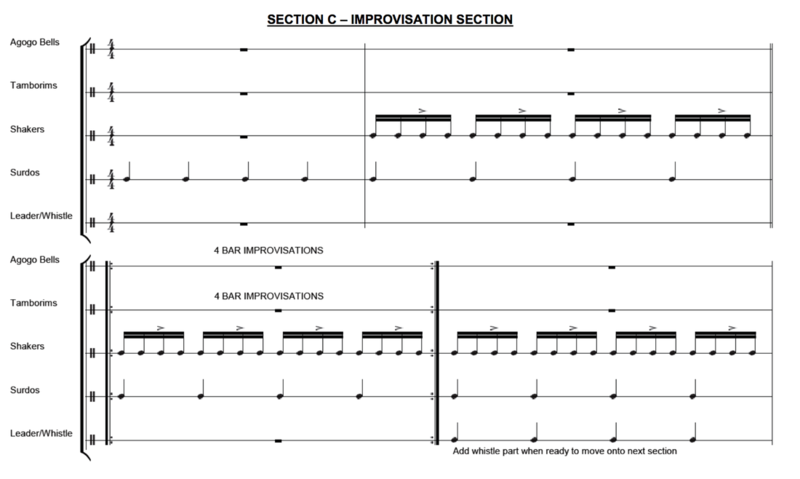 Use the rhythm grid to help you. You can have all of these parts and rearrange accordingly. Split your group into 5 smaller sections and get them to compose a section of music. Bring your group together to teach the section to the group. Rehearse, refine and develop. How can it be improved? 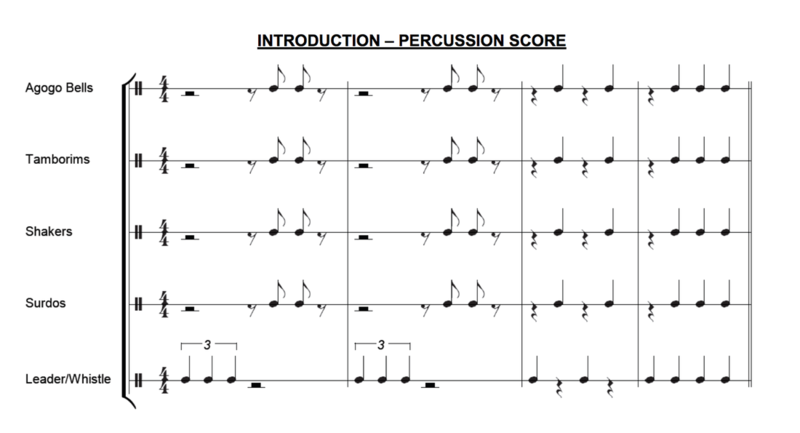 Make it sound like Samba, Use Syncopation and Polyrhythm and sections in unison. A good video on a Samba group playing to help inspire you. Note how they change between polyrhythm and unison. Take notice of how they vary the walking rhythm too. Your music will be recorded on video and published. and how well you meet the criteria. Your homework is to write a short story imaging you are at a carnival. You can hear the Samba music and you can see the people dancing and taking part. I want you to describe what it is like to be there, the sights and sounds and how people are interacting and dancing to the music. What do you think the music makes the people feel there? What does the music feel like to them? You will work in groups to learn the Samba de Janeiro. You will then come together as a class to give your performance. The performance will take place in front of the whole school, so it needs to be good. You will have been given your parts and sections. Homework: Have a listen to this piece of music. Ask the class to stand in a circle and keep a steady beat with their feet (walking on the spot) referring to the role of the “Surdo” group in “Samba da Janeiro”.  While everyone keeps the beat steady, use clapping or body sounds (from starter activity in lesson 2) to play them some rhythms which they echo back to you – CALL AND RESPONSE.  Now tell the pupils that instead of copying what you clap, they can make up their own rhythms when they respond. You may want to draw a parallel with spoken conversation, where you don’t just repeat what the other person says. You can demonstrate this idea first by asking a confident pupil to provide you with a “call”, to which you respond in different ways. 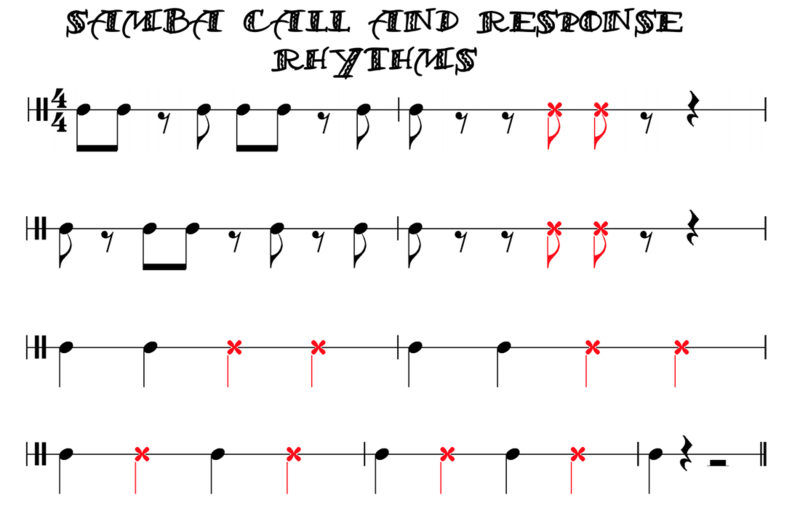  Lead the class with different “call” rhythms to which they can respond in different ways. 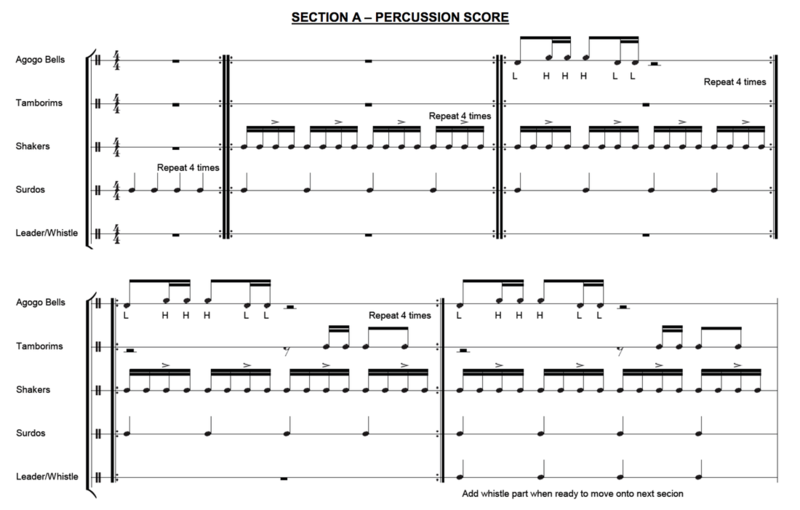 Learn about polyrhythms and rhythm loops and how these are used in Samba. Learn about the importance of signs and signals as a cue for changing section in Samba. Learn about the instruments used in Samba. 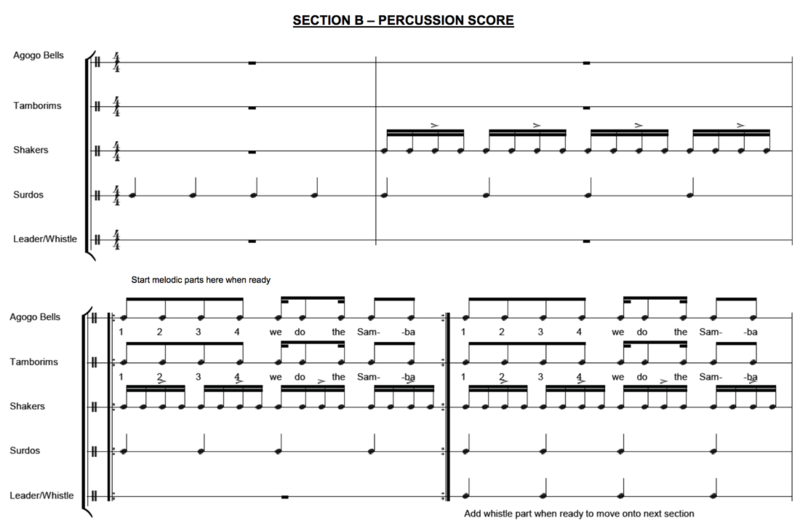 Start the two groups together so that a POLYRHYTHM develops with different body sounds. A suitable point to end the routine and to reinforce the importance of signs and signals in Samba music as a cue for changing rhythms and sections is to listen for the point where the two groups clap together (group 1 on their 3rd cycle and group 2 on their 4th). At this point they clap with their hands in the air and shout “Hey!” Swap groups and perform again. We will learn this piece as a class to perform in school. Homework Using a piece of A3 paper (No computers, use your artistic talents) Design an info-graph page on one of the Samba instruments in the picture. Use at least three interesting facts that you find out about the instrument for your info-graph. To understand what Call and Response is. Call and response - See below but where the group is split into two. A call group and a response group.